In today’s digitally connected world, where accessing medical records, ordering groceries and paying taxes can all be done online, many internet users find it daunting to keep up with all the various passwords associated with their online accounts. One consequence is that a significant minority of users settle for less secure passwords they can more easily remember. A new Pew Research Center report finds that 39% of online adults report having a hard time keeping track of their passwords. Compared with the 60% of online adults who do not express difficulties keeping up with their passwords, this “password challenged” group also tends to be more worried over the safety and security of their passwords. Those who do find password management difficult are twice as likely as those who do not to report worrying about the security of their passwords (44% vs. 22%). These findings connect to a broader discussion of cybersecurity and the role of key institutions in digital privacy. Nearly two-thirds of U.S. adults have fallen victim to some type of data theft or fraud, and many have little to no confidence that key institutions, like government agencies or social media companies, can keep their personal data safe and secure, according to Pew Research Center survey data. Despite these experiences and concerns, many Americans are not following digital security best practices in their own personal lives, and this is especially true among those who are “password challenged.” For example, they are more likely to say they use passwords that are less secure because complicated ones are too hard to remember (41%, vs. 14% among those comfortable with managing passwords) and say they use the same or similar passwords across multiple websites (45% vs. 36%). These “password challenged” internet users are also more likely to keep track of their passwords by writing them down on a piece of paper, saving them in a digital note or by saving them in their web browser – all things that are considered less desirable practices among cybersecurity experts. 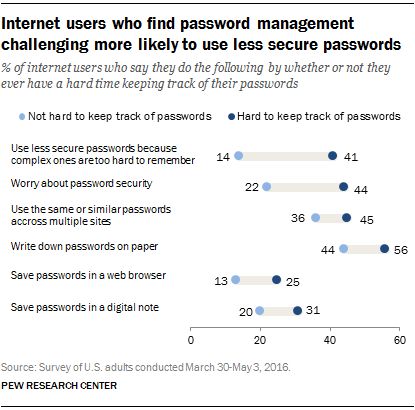 Age factors somewhat into whether or not people have difficulty managing their passwords, with this sentiment being most common among those in their early 30s through mid-60s: 44% of online adults ages 30 to 64 say they have a hard time keeping track of their passwords. In comparison, 33% of adults ages 18 to 29 and 30% of those 65 say they have a hard time keeping track of passwords.